Initially composed of four panels, this piece was originally of a different size. Recent tests have proved that its lower section has been cut on both sides. Prior to this recent modification, the work underwent further changes. 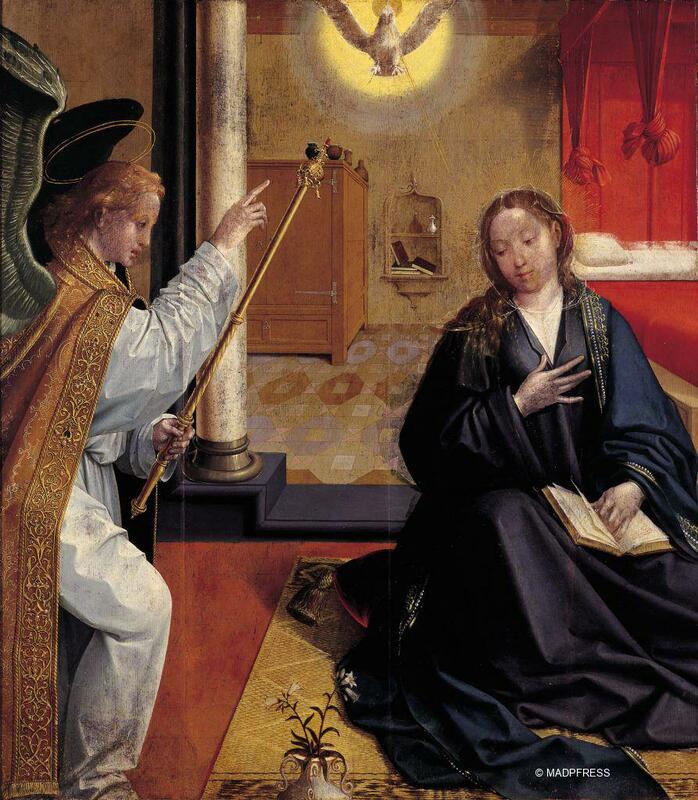 The Virgin Mary is represented in the second condition of the Angelic Colloquium of the Mystery of the Annunciation, by Friar Roberto Caracciolo de Lecce (1425‒1495). That is to say, this is the moment of cogitatio or reflection, in which the Virgin considers the Angel’s words and demonstrates her prudence. Similar to other paintings alluding to this theme, the work bears witness to symbolism characteristic of representations of the Annunciation: the book that lays opened before Mary; the vase with lilies; the Angel’s sceptre; the bed, topped by its canopy and with its prominent front curtains, upon which the knots are formed; the column between the two characters, and the mat on which Mary is found standing. In recent years, the study of textiles through paintings, in its manifold categories, has proved to be very useful. Aside from documental sources and extant objects, paintings provide important visual evidence concerning an object’s trade and usage throughout time. In this particular painting, representing a Portuguese domestic interior, the Virgin Mary stands on a mat. Following the Islamic presence in the Iberian Peninsula, which stretched well into the 16th century, floors were commonly covered with mats, mainly in the summer, when they replaced carpets. Although this mat could be of Portuguese manufacture (Lisbon, Oporto or the Algarve) it has been associated with the mats woven with palm fibre and decorated with geometric patterns from sub-Saharan Africa, particularly those from the Congo (and Benin and Niger). Authorship was attributed to the Lourinhã Master (active between 1500 and 1540) by Luís Reis Santos in his work dedicated to this artist and published in 1963. This attribution has been rejected in more recent studies, thus it is classified here as the work of a follower of the master. This was one of Ricardo do Espírito Santo Silva's first pieces towards his collection of primitive artworks; donated by Ricardo do Espírito Santo Silva in 1953. Saldanha, Nuno, Tesouros das Imagens, colecção Museu-Escola de Artes Decorativas Portuguesas – Pintura, Lisbon: FRESS, 1996. Paulino, Francisco Faria (ed. ), África: nas vésperas do mundo moderno, Lisbon: CNCDP, 1992. Licenciada em História de Arte (Univ. Coimbra) e pós-graduada em Gestão Cultural nas Cidades (INDEG/ISCTE). Entre 1993-2002, na Comissão Nacional dos Descobrimentos Portugueses, foi responsável pelo comissariado executivo, produção e gestão de grandes exposições e catálogos, e coordenadora de itinerâncias internacionais, realizadas em Portugal e no Estrangeiro. Destacam-se “Memórias Árabo-Islâmicas em Portugal”, “Culturas do Índico”, “Marrocos – Portugal: Portas do Mediterrâneo”. É sócia-gerente da empresa TerraCulta, Lda, onde desenvolve projectos de conceptualização, gestão e produção cultural. É Directora do Museu de Arqueologia de Silves e do Centro de Interpretação do Património Islâmico. É vice-presidente da Associação Multiculti – culturas do Mediterrâneo e integra a equipa portuguesa da Fundação Euromediterrânica Ann Lindh para o diálogo das civilizações.